Thank you for your interest in one of Trust Auto's online offerings. Please continue for more information regarding this Loaded 2008 Mercedes-Benz ML 320 3.0L CDI Turbo Diesel with only 99,226mi. CARFAX BuyBack Guarantee is reassurance that any major issues with this vehicle will show on CARFAX report. On almost any road condition, this Mercedes-Benz M-Class 3.0L CDI offers solid performance, reliability, and comfort. Sophistication & understated luxury comes standard on this Mercedes-Benz M-Class 3.0L CDI. Well-known by many, the M-Class has become a household name in the realm of quality and prestige. Simply put, this Four Wheel Drive is engineered with higher standards. Enjoy improved steering, superior acceleration, and increased stability and safety while driving this 4WD Mercedes-Benz M-Class 3.0L CDI. It's not a misprint. And the odometer isn't broken. This is a very low mileage Mercedes-Benz M-Class. A rare find these days. With all records included, feel comfortable knowing that the history of this Mercedes-Benz M-Class 3.0L CDI is provided in order for you to make a knowledgeable decision. Pre-owned doesn't have to mean "used." The clean interior of this Mercedes-Benz M-Class makes it one of the nicest you'll find. Give your passengers the best ride ever with a premium entertainment package. They say beauty is on the inside and once you experience the unbelievable options in this Mercedes-Benz M-Class, you'll agree that this is one beautiful vehicle. Added comfort with contemporary style is the leather interior to heighten the quality and craftsmanship for the Mercedes-Benz M-Class This 2008 M-Class 3.0L CDI has extra options like the Mercedes-Benz navigation system. The additional feature will keep you safe and will make this Mercedes-Benz M-Class even more dependable. The Contenental tires on this exceptional vehicle have minimal wear and look to be nearly new. How's the paint you might ask? It's flawless. One of the best finishes we've ever seen. The Mercedes-Benz M-Class 3.0L CDI is exactly what you would expect out of a Mercedes-Benz. It's decadently opulent, meticulously engineered and unapologetically grandiose. 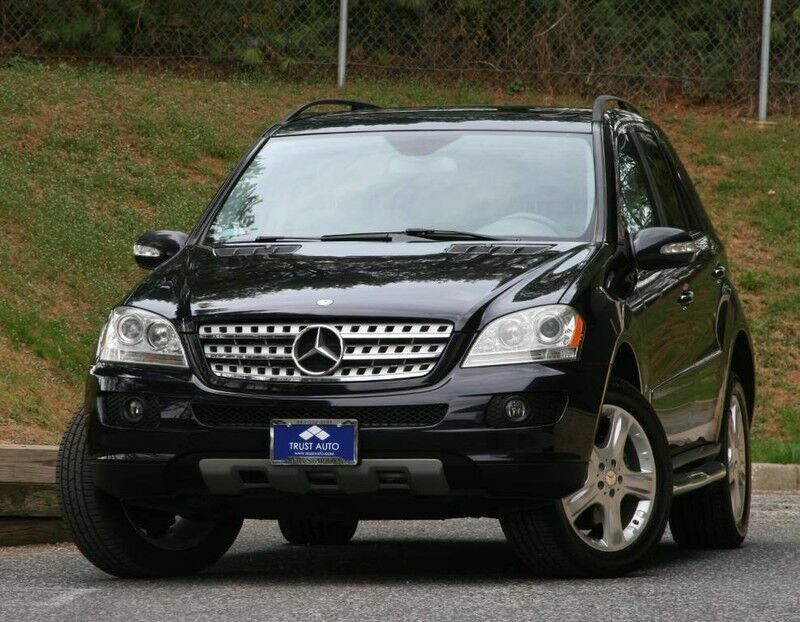 We are proud to offer this 2008 Mercedes-Benz that truly a "must-have." This vehicle's wheels are one of the many attractive features that this M-Class 3.0L CDI has to offer. More information about the 2008 Mercedes-Benz M-Class: The Mercedes-Benz 2008 M-Class is on-road friendly and a good family hauler, with improved ride and handling, while still maintaining its off-road ability. The ML320 CDI is notably frugal as well as luxurious, while the ML550 adds more luxury and power, and the ML63 AMG leads the pack in exclusivity, at about double the price of the ML350. This model sets itself apart with fuel-efficiency (ML320 CDI), Comfortable ride and seating, acceleration (ML550 and ML63)., and off-road ability *30 DAYS / 1000 MILES POWER-TRAIN WARRANTY INCLUDED (ENGINE, TRANSMISSION, DIFFERENTIALS)* *TRADE INS ARE WELCOME* Trust Auto is one of the top pre-owned vehicle dealer in Maryland. We provide quality vehicles of various makes and models with the most competitive prices in the region. Trust Auto is dedicated to make your vehicle shopping experience hassle free and straight forward. With that in mind we fully inspect, service and detail all cars in the lot. We are open 6 days a week now FOR YOU!!! Monday - Saturday 9am - 7pm. Some vehicle information and pricing may be unintentionally missing or inaccurate, and Trust Auto will endeavor to correct such discrepancies in a commercially reasonable manner after being notified of any errors. Pricing errors and listing errors are considered invalid and may not be honored at the sole discretion of Trust Auto. Prices subject to change without notice and do not include Title, License, Registration Fees, State or Local Taxes, $895 PDI & $299 Dealer Processing Fees. Please contact seller for vehicle availability. All vehicles with PDI are sold with a 30 day / 1,000 mile warranty! EPA mileage estimates are provided for comparison purposes only. Actual mileage may vary depending on driving conditions, driving habits, and vehicle maintenance. Mileage listings are estimates and are not necessarily accurate odometer readings.